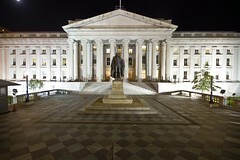 WASHINGTON D.C. – Banks and financial institutions around the world have been given a welcome reprieve, as the USA delays enacting new withholding on international payments. In a statement issued at the end of last week the US Department of the Treasury announced that financial institutions based outside of the USA have been given six more months to complete all the procedures necessary to comply with the US Foreign Account Tax Compliance Act (FATCA). The FATCA system is intended to stamp out the occurrence of tax evasion and the hiding of incomes by US taxpayers, requiring all foreign financial institutions to disclose information about their US clients, or collect a 30 percent withholding on any transactions passing through in the interest of an American taxpayer or in connection to any US derived incomes. The withholding provision was scheduled to come into effect on January 1st 2014, but, according to the Treasury, the date has now been pushed back to June 30th 2014.